The pastry chef aboard the Viking Vili had no fear of losing his job because of me. My pathetic attempt at making a gingerbread house during his lesson on board put my skills at the kindergarten level. His fanciful creations in the ship’s lounge looked like they were conjured up by a Christmas elf employing Santa’s magical powers. 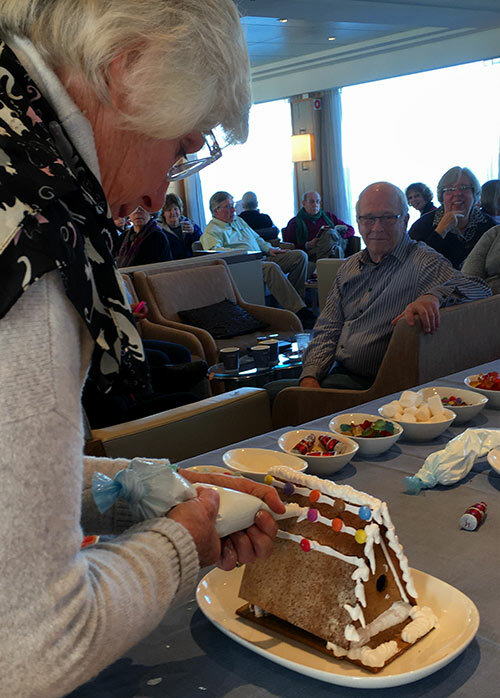 Gingerbread houses, Christmas trees, caroling and concerts on board ships add extra spice to cruises on Europe’s rivers during the month of December. But the biggest incentive to don winter coats and hats is the Christmas markets in ports along the way. 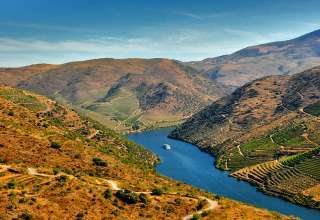 Almost every city has at least one filling municipal and cathedral squares in the weeks leading up to December 25 and almost every river cruise line operating in Europe extends it cruise season into December to take advantage of the holiday glow. I was aboard Viking River Cruises on its Danube Waltz itinerary cruising from Budapest, Hungary to Passau, Germany with stops in Bratislava, Slovakia, Vienna and Linz, Austria. 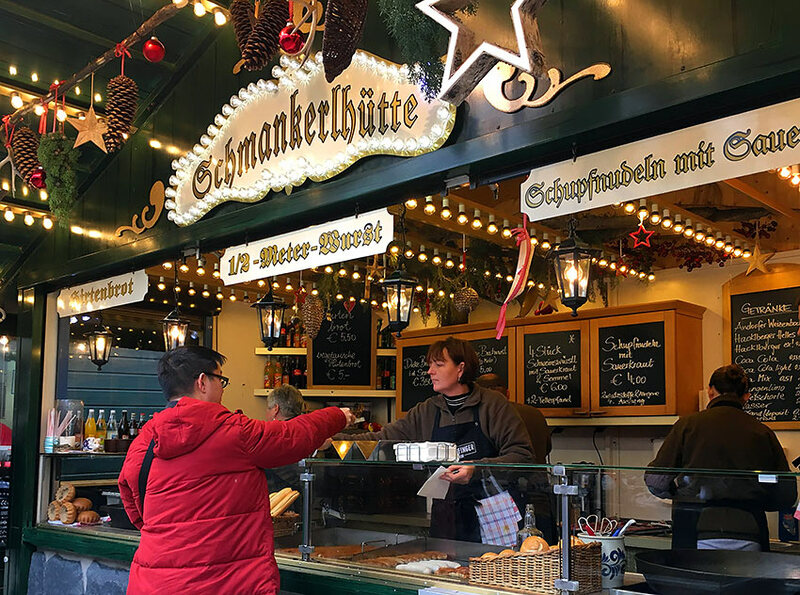 Each city’s Christmas markets embraced the festive season by selling decorations, holiday novelties, food and mulled wine to warm heart and soul under twinkling lights on cold December evenings. Some added musical entertainment and carnival rides. Can one be too old to climb aboard a carousel? An infectious holiday cheer brought smiles to passengers and crew on board. One afternoon crew members donned Santa hats and reindeer headbands to lead passengers in a sing-along that ended with a conga line winding through the lounge. 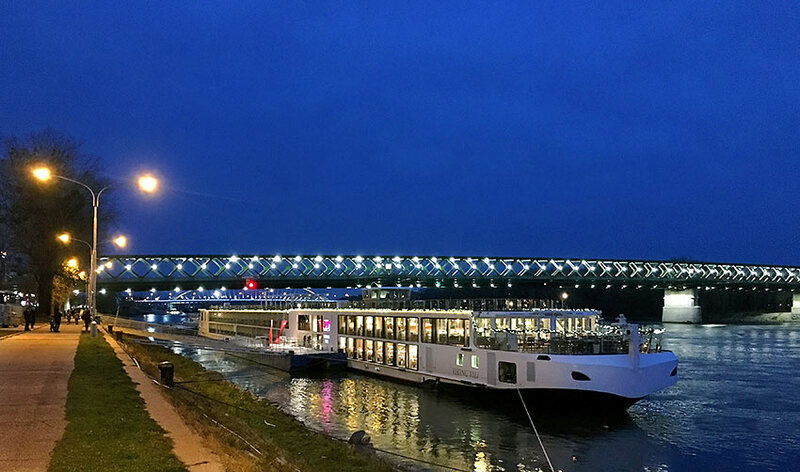 An advent choir boarded the ship after dinner in Bratislava for an a cappella performance. 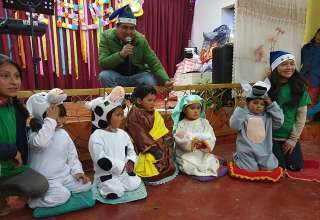 In Austria, costumed singers and musicians presented songs from “The Sound of Music” and ended the evening with Christmas carols — “Silent Night” in three languages. Passengers participated in trimming Christmas trees, personalizing globe ornaments with markers. The pastry chef patiently taught us the art of gingerbread house-making and to my envious eyes some structures turned out quite good. The kitchen crew made an extra effort to warm us up with a holiday glow. After a shore excursion one chilly afternoon the chef welcomed returning passengers in the reception area with cheese fondue spread on slices of fresh bread plus cups of hot chocolate with an optional splash of rum or amaretto. 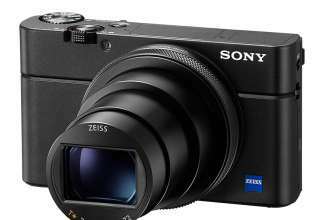 Have holiday gifts to buy for family and friends back home? Bring an extra suitcase. Cities along the Danube offer shopping districts with brand-name stores as well as cute boutiques. And, of course, the Christmas markets present a bounty of items, some handmade. Christmas markets bring out residents, especially after work and on weekends. If you’re game, you might interact over a glass of gluhwein. After visiting two or three markets, the next few might seem just the same, but be on the lookout for one-of-a-kind finds and local food specialties. In Budapest, crowds filled two Christmas markets within walking distance of our ship. A Nativity scene with large, colorful figures stood in front of St. Stephen’s Basilica where a Christmas tree towered over an ice rink. Vendors in wooden huts sold Christmas ornaments, marzipan, Hungarian fried bread and steaming cups of mulled wine. In Slovakia, sausages and potato pancakes simmered on stoves in a small market outside Bratislava Castle perched 300 feet above the Danube. 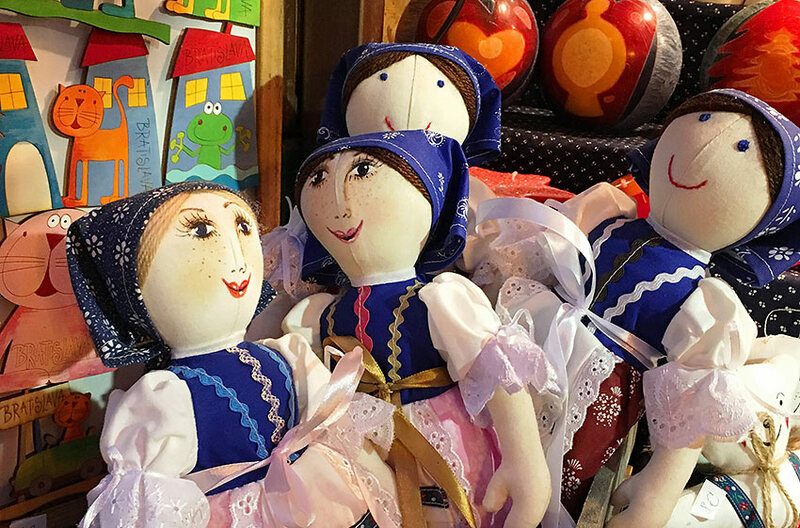 Our excursion stopped for a view from the windy terrace then descended to the Old Town for a walk on cobblestones past warmly lit cafes to a Christmas market where cloth dolls in folk dress caught my eye. In Vienna, I strolled past Rolex, Dior and Tiffany stores on Kohlmarkt Street on my way to Café Central where a glass case overflowed with pastries. A reindeer head made from gingerbread mousse and baked apple called out to me. 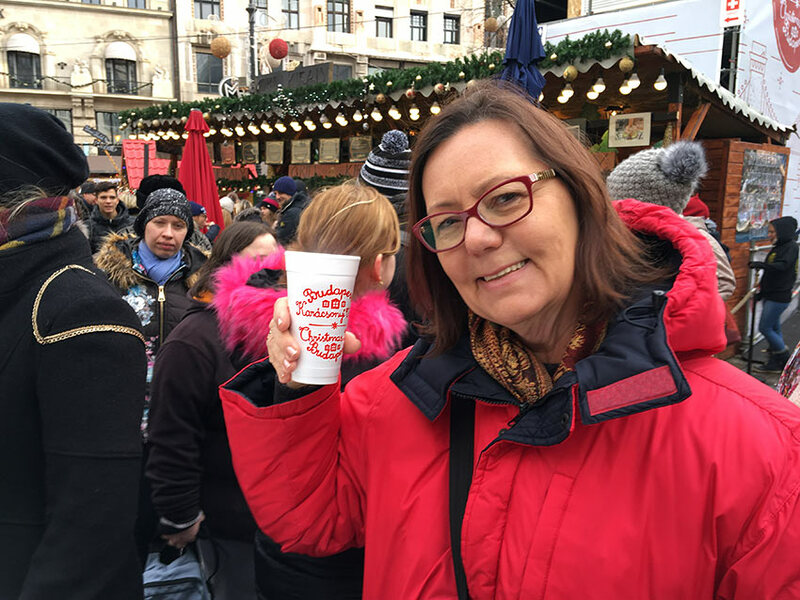 Christmas markets were scattered across Vienna, one by city hall, another at Am Hof where raclette oozed onto plates and flutes of Champagne bubbled on a wooden bar. Outside Hofburg Palace, a few vendors sold high-end goods. I couldn’t resist a jaunty made-in-Austria woolen hat. 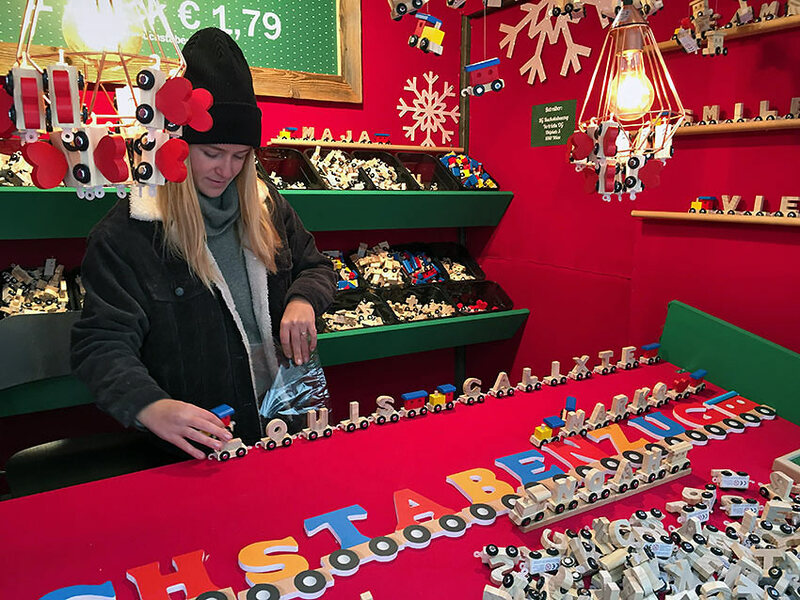 At my favorite market, outside St. Stephen’s Cathedral where Mozart married in 1782, I had to have two wooden toy trains in letters spelling my grandsons’ names. That night, we boarded a motor coach to travel along city streets lit with holiday decorations to a small theater for a Mozart and Strauss concert just for Viking guests. In Linz, Austria, streetcars streamed past Christmas market stalls on the Hauptplatz, one of the largest squares in Europe, but shoppers seemed so engrossed in the goods they barely noticed. My search for an authentic Austrian gift for someone back home yielded only apparel from distant lands — Peru, Nepal, China — so I left, disappointed. In Passau, Germany, our tour group went to Café Simon for a demonstration of gingerbread making with samples of three flavors washed down with an orange and rum punch. Refortified, I made my way to the plaza outside St. Stephen’s Cathedral where bells sounding the hour reverberated around more than 70 rustic wooden Christmas market kiosks. Patrons stood around high tables snarfing down foot-long wurst sandwiches. I resisted the temptation of gluhwein stands to seek out something German-made for that someone still on my gift list. I found it inside a make-shift shop where a young woman was selling woolen hats and cute head wraps made by her German grandmother. 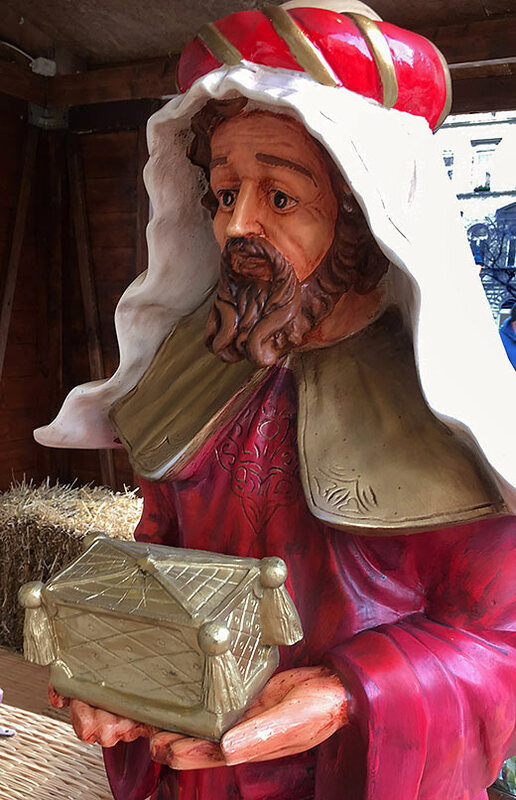 Just when passengers think they have seen their last Christmas market, those departing from the Munich airport find one more under a canopy between terminals. More than 40 market stalls and 450 Christmas trees set up here along with an ice-skating rink with skate rentals for those who want to do a few spins before their flight departs. For once, I was glad mine was delayed.